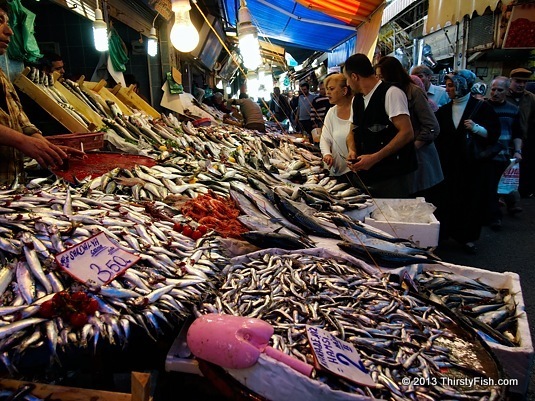 There are many fresh-catch fish merchants like the one pictured above in the Kemeralti Historical Market. Fish is a significant part of the Turkish cuisine. Fish has been and continues to be an important source of nutrition throughout recorded history. But in recent history, all fish are contaminated in various degrees by biotoxins, mercury, other toxic metals, dioxins, flame retardants, PCBs, DDT and other pesticides, petroleum, arsenic, melamine, etc. Chemicals on land and in the air end up in lakes, rivers, streams, bays, and the ocean, and fish take these chemicals from foods they eat. When we consume fish, we in turn take in these chemicals. Pretty much all fish in the world is polluted. The EPA issues regular Fish Consumption Advisories on their website. Another problem is overfishing. The question begs itself: Where are we heading? We continue to destroy our landbase, and our seafood resources as if these resources are infinite.